Alliant Energy donated $5,000 to Project Lead The Way. DEIMCO donated $6,000 to Project Lead The Way. Alliant Energy and DEIMCO Finishing Equipment each presented the District with checks Monday night supporting Project Lead the Way. Kirk Shirar presented a check for $6,000 from DEIMCO and David Vollmar from Alliant Energy presented a check for $5,000. Miller Middle School students Victoria Johnson and Jacqueline Wahl are heading to the nation’s capital next month to compete in the National History Day contest. The students were recognized before the Board Monday evening along with Ann Jackson, Miller Extended Learning Program teacher. The Board also approved the duo’s out-of-state trip request to compete at nationals, which take place June 15-19, 2014, at the University of Maryland. Read more about their exhibit here. Marshalltown Community School District preschoolers will not have classes on Wednesdays starting this fall. Emily Banks, district preschool coordinator, told the Board the change will provide for better teacher collaboration, time for Individual Education Plan (IEP) meetings, and required home visits. It also alleviates some equity issues with Wednesday classes, as schools dismiss one hour early, so students in the afternoon preschool classes are at school a shorter amount of time than students in the AM sections. Banks said this change, which was communicated through the registration process in April and during IEP meetings, has been well received since the short Wednesday afternoon classes have been a transportation and daycare headache for parents. The State of Iowa requires preschool students receive 10 hours of instruction each week following the Quality Preschool Programming Standards. Class sizes are capped at 20 students. Marshalltown Schools has nine preschool classrooms with 18 sections, with classes held in the morning and afternoon. The Board approved hiring the first slate of teacher leadership positions Monday night as part of the Teacher Leadership Compensation Plan. Marshalltown Community School District is in the first group of Iowa school districts selected to launch teacher leadership systems next school year. Teacher leadership systems will allow teachers to work in greater collaboration with colleagues and school administrators to improve instruction and increase student achievement. Out of Iowa’s 346 school districts, 146 applied to start teacher leadership systems in 2014-15 and 39 were selected. Marshalltown’s teacher leadership model includes model teachers, instructional coaches and curriculum and professional development leaders working together to support the District goal of increasing student achievement. Monday evening the Board approved hiring the instructional coaches and curriculum/professional development leaders. Instructional coaches will receive an additional $5,000 stipend and 10 additional contract days. Curriculum/PD leaders receive an additional $10,000 stipend and 15 additional contract days. The District will next select model classroom teachers, who will receive a $2,000 additional stipend and 5 additional contract days. The Board approved a contact with the union representing paraeducators Monday. The total package increase for 2014-2015 is 3.59 percent, approximately $113,000 in additional costs. The agreement increases immediate family illness leave from two days to four, “for purposes of administering to the needs of sick minor children or dependent adult children.” The agreement also adds grandchildren to the list of immediate family for bereavement leave purposes. The wage scale will be condensed from 27 steps to 15 and include an across-the-board increase totaling 3.59 percent. The boys’ locker rooms at Miller Middle School will receive an upgrade this year. The Board approved a project to renovate the facilities, with work slated to being in late June and conclude in early October. The project includes reinforcing the existing roof to accept new rooftop air handling and energy recovery units. The bulk of the existing locker rooms have not been remodeled since the 1960s, so most of the interior will be updated and made handicap accessible. Construction costs are expected to be near $414,000. While work is in progress a room near the gym will be converted to a temporary boys locker room. Tonight the Board approved the renovation plans for the Miller Middle School Boys Locker Rooms. Many remember the area where this renovation will happen and the need to upgrade the remaining areas of the 1927 building. We appreciate the time is has taken to do a full renovation at Miller and we are now closing on the final phase of work in the Auditorium. The Roundhouse renovation is continuing even with weather delays from the past winter and spring. We are planning to close the building after graduation and have been told to expect the work complete about Thanksgiving of this fall. Please, bear with us as parking and access to the Roundhouse will be a challenge this graduation. We expect a spectacular result and air conditioning when the building reopens. The majority of staff are aware of the importance Marshalltown Schools places on improving the “instructional core”- the classroom environment where engaged students, quality teaching and challenging content combine to influence student success. Monday’s Board of Education meeting included an update on two opportunities to significantly influence the instructional core: Teacher Leadership and Compensation System, and Iowa Competency-Based Education Collaborative. Teacher Leadership and Compensation allows Marshalltown Schools to expand leadership opportunities for teachers in ways that will accelerate district-wide implementation of Comprehensive Literacy Model and Sheltered Instruction, as well as alignment of curriculum with the Iowa Core. Marshalltown Schools will be able to accept online payments for things like lunch accounts this fall. The District has researched online payment and online registration options this year and reported its progress to the Board Monday night. Jason Staker, communications director, told the Board they had reviewed online payment systems, talked to other districts, and had presentations and discussions with vendors. There are a few more steps to take before the committee is prepared to select a single vendor for online payment, but Staker reported the consensus was a choice would be made and ready for implementation in the fall. Staker told the Board online payments could be done without having online registration, but not vice versa. Online registration is the next item the group will address. Staker and David Stanfield, instructional design specialist, told the Board they will work with the registrar and Human Resources department in order to determine how best to implement an online registration component. The committee that looked into online registration included Staker; Stanfield; Kevin Posekany, director of business operations; Jody Brintnall, business office manager; and Jeff Weinberg, director of information technology. 402.6, 402.6R, 402.6R1 Social Media Responsibility, waive second reading. 602.3 Senior High School Curriculum, waive second reading. Initial Review – Tabled until June 2 meeting. State Envirothon champions (L to R): Sean Finn, Abby Snyder, Adam Willman, Dayana Carrera, Chandler Fisher. 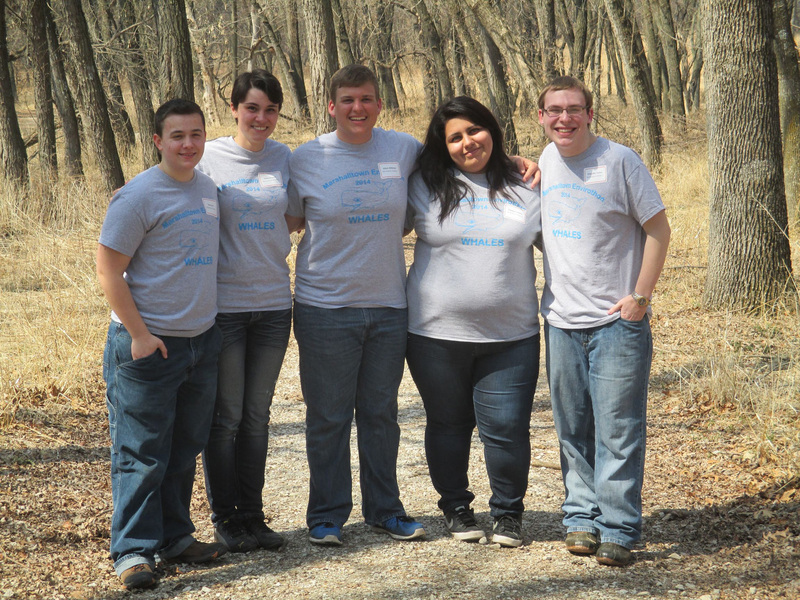 Marshalltown High School’s state championship Envirothon team will compete in the 2014 Stewardship Challenge held Aug. 4-7 at Loyola University in Chicago. This year’s national Envirothon was cancelled due to a change in sponsorship, so the contest in Chicago is a chance for Midwest teams to still compete on a regional/national level. Susan Fritzell, MHS Extended Learning Program teacher and Envirothon sponsor, was present at the Board meeting along with four of the five team members: Chandler Fisher, Abby Snyder, Adam Willman and Sean Finn (Dayana Carrera was unable to attend). “They’re really smart and really capable, but they also work really hard,” Fritzell said. Two of the teammates, Snyder and Willman, will be unable to attend due to their designation as World Food Prize Interns. Snyder will be conducting research in Nepal and Willman will be in Turkey. Read more about the state Envirothon championship here. 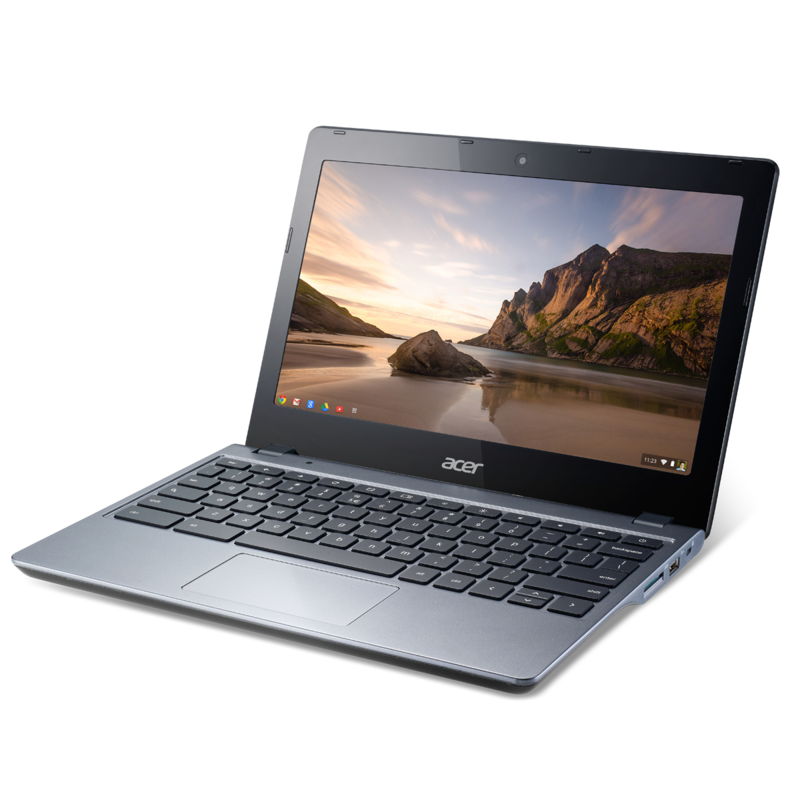 All students at Lenihan Intermediate and Miller Middle schools next year will have Acer C720 Chromebooks beginning in the fall. The rollout of devices is the next phase of the District’s Digital Conversion initiative started this year. In January of this year sets of Samsung Chromebooks were issued to all District third and fourth grade and 7-12 science classrooms. Initial plans for next year’s rollout included devices in sixth grade, but skipped fifth grade. The new plan allows for students already using Chromebooks to continue with them next year. “We want the devices to follow the students,” said Dr. Susan Pecinovsky, associate superintendent for student achievement. Acer Chromebooks have a faster process which equates to a longer battery life, said Jeff Weinberg, director of information technology. They also have a more solid build quality. The new Chromebooks will be student issued, meaning students will carry a Chromebook with them during the day instead of utilizing a classroom set. Devices will remain at school for next year while the District continues exploring ways to provide anytime, anywhere access for students and enable 24/7 learning. The cost of next year’s Chromebook rollout is approximately $442,705, which will be covered through textbook adoption funds and computer replacement funds. The Board reviewed Iowa Assessments results Monday night and discussed how to increase student achievement. Results were reported according to District Strategic Action Plan indicators, which look at increasing percent proficient in grades 4, 8, and 11 for math and reading and increasing students scoring advanced in the same grades and subjects. The 2013-2014 results showed growth in three of six areas, but only 8th grade reading scores increased enough to meet SAP projections. Dr. Susan Pecinovsky, associate superintendent for student achievement, said one area of growth not seen in the SAP indicators is Lenihan, where students met all but one target this year. “The things we’re doing in the elementary buildings are gaining some momentum,” she said. Among advanced students the District met four of six SAP indicators, increasing the percent of students scoring advanced for math and reading in both fourth and eighth grades. Once challenge the District faces is the alignment of test items to the Iowa Core Curriculum. Less than 40 percent of math and 50 percent of reading test items align to the Iowa Core, which all schools in Iowa are required to implement beginning next school year. “It’s a challenge,” Pecinovsky said. She told the Board the next step is to review the assessments results at the building level, conducting item analysis and determining next steps for the District. The Board asked to review data for each building, as well as their attendance center plans and how they’ll work to increase student achievement. Marshalltown Schools will purchase three new buses from Hoglund Bus Company. The total cost is $236,514 to purchase a 35-passenger, a 65-passenger, and a 71-passenger bus. The price is after a $3,000 reduction for trading in a bus. The Board approved a settlement with union representing buildings and grounds employees and transportation mechanics. The settlement is a 3.67 percent total package increase, with a 2 percent across-the-board wage scale increase and an increase in insurance. REW Services Corporation of Ankeny will complete the asbestos abatement at the MHS Roundhouse interior track. The company had the low bid of $153,454. Removing the track is part of the overall Roundhouse project and should be completed during the month of June. The Board will upgrade the entrances to four schools this summer, installing security vestibules similar to systems used at Anson and Fisher elementary schools. Franklin Elementary, Woodbury Elementary, Hoglan Elementary and Marshalltown Learning Academy will each receive upgrades to their main entrances. The anticipated cost for the project is $180,000 and is scheduled for completion at the start of the 2014-2015 school year. Monday’s Board of Education meeting included a comparison of Iowa Assessment results to performance targets of our Strategic Action Plan. Some scores prompted celebration, and others elicited frustration or anger, but no score was received without some form of emotional reaction. I hope others recognize these responses as an expression of strong concern for the academic success of every student in Marshalltown Schools. Each board member knows the limitations of the Iowa Assessment, yet is well aware that scores on this assessment have been identified as important indicators of our progress as a district: if we are doing the right things then scores should go up (some did); if scores are not going up (some did not), we must question the validity of the practices we have in place. As most of you know, these conversations are already occurring in small and large group settings throughout Marshalltown Schools. Dedicated teachers are working together to analyze Iowa Assessment results and to adjust our curriculum where necessary – while keeping in mind the Iowa Core must be implemented K-12 next year. The Board and I recognize the employees of Marshalltown Schools work tirelessly toward the goal of increased student learning. Thank you for your professionalism, compassion and commitment – during this 2014 National Teacher Appreciation Week and throughout the year. 601.2 School Calendar, bring back for first reading. 601.3 School Day, bring back with wording from Dept. of Education. 602.1 Elementary Curriculum, mark reviewed. 602.2 Middle School Curriculum, mark reviewed. 602.3 Senior High School Curriculum, bring back for first reading. Due to various circumstances there was no Board Report published for April 7 or April 21, 2014. Look for the next issue of The Board Report after the May 5, 2014, meeting of the Marshalltown Community School District Board of Education.